The Rich Outdoors is about inspiring you to get after it in the backcountry and learn from others. I love chatting with the less know killers you get after it and aren’t just seeking the fame and attention. Today’s guest is no exception and I really enjoyed getting to know Jordan Budd (@jordan.budd). Jordan is someone I had seen throughout social media and through friends of friends met at a trade show. 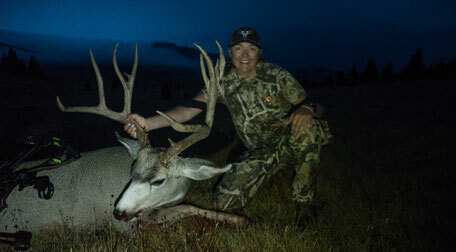 I Love Jordan’s story and her true passion of the outdoors. Jordan gets after it, and just like in this podcast, you can hear it in her voice that she has a true love for the backcountry. I really enjoyed getting to know Jordan and her journey to success. As well as our conversation about not just hunting but the places that hunting takes us, something I think about often when alone in the backcountry. We also dive into some of Jordan’s reviews on Rokslide where she commonly writes on various products. Including the Maven 15’s which I would like to get one of these days. I’m a huge fan of my maven 11×45’s so was curious what she thought of the 15’s compared to the Swaro’s. Today’s episode brought to you by On X Maps. I’m sure you have heard me talk all about On X, but I recently found a cool feature that has been really handy for me. One of the fun or not so fun things about moving to a new state are that I don’t have the years and years of area knowledge that I had in Oregon. So with Turkey season right around the corner I really don’t have a clue on where to turkey hunt. Well, I was playing on my On X account and found an upland bird distribution that shows turkey distribution throughout the state. From there I can add the public/ private map layer and start search areas that hold turkeys and have public land or even block management that has access. Anyway, just one cool feature and how I am using it to find birds in a new area. Use the TRO podcast code when you sign up and get 20% off your On X membership. This episode also brought to you by Backcountry Fuel Box. Backcountry Fuel is the perfect way to test out, stock up, and save money on great products without having to order or ever pay to ship. For $30 bucks you get up to $50 in high-quality options for your next hunt, hike, or if you’re like me when you are just hungry and don’t want to make anything. With the Backcountry fuel subscription there is no commitment feel free to cancel anytime, but so far the feedback has been amazing. Backcountry Fuel box is the monthly subscription box that is full of things you will actually use. Head over to www.backcountryfuelbox.com and sign up by April 15th to get in on the April Box and use the TRO code to get 10% off every month.